The backyard of Pat Baker's home in Goderich, Ont., is shown shortly after a fragment of a skull was found near her newly poured patio. In the months that followed, Ms. Baker would pick up the tab for three archeological digs and the costs of repairing her lawn, watering system and eventually her garden. The spring of 2017 is not going to feature as Pat Baker’s favourite. On March 8, her third husband, Duff Scott, an 80-year-old investment banker, died of a heart attack. They’d been married 12 years. Two weeks later, on March 21, still in the grip of burying and missing him, Ms. Baker received an e-mail from Jeremiah Sommer. 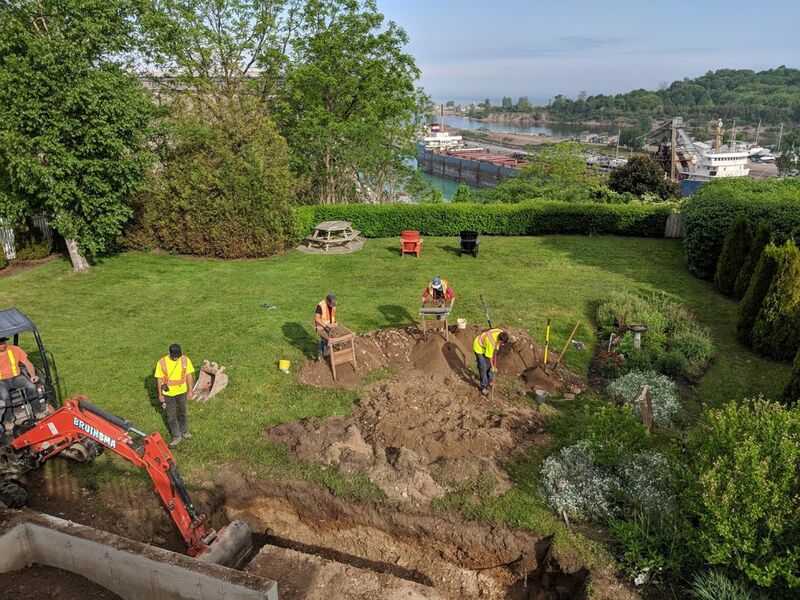 She and her husband had hired Mr. Sommer the previous January to add a new patio to the back of their summer house on the shore of Lake Huron in Goderich, Ont. 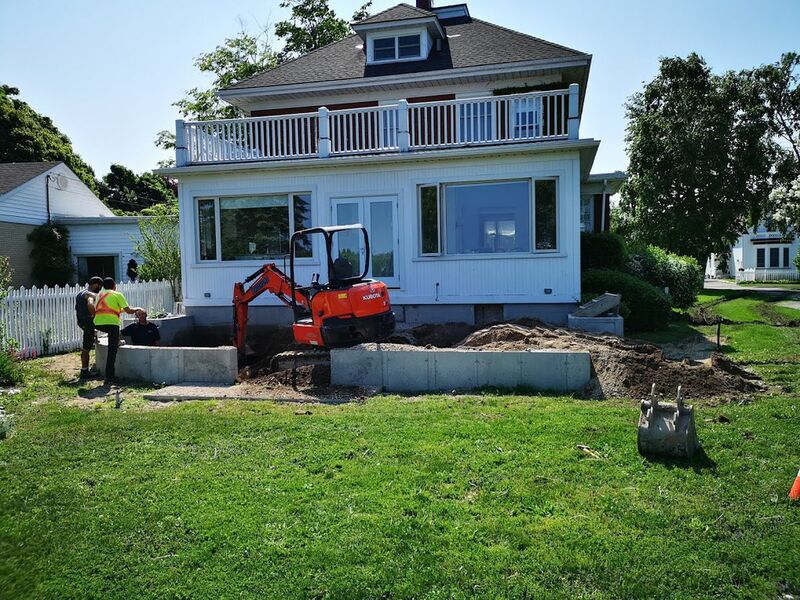 The contractor explained that he’d “run into a bit of a situation”: A human skull, or part of one, had turned up in the backfill around the patio. As the law requires, he immediately called the Ontario Provincial Police. Within two days, the OPP’s forensic anthropologist had cleared Ms. Baker as a suspect and concluded the skull was vintage – probably from the 1880s – and therefore not worthy of criminal investigation. Ms. Baker thought the story might die there. But she had overlooked Ontario’s seldom-mentioned but extremely fussy Funeral, Burial and Cremation Services Act (2002), which has been law since 2012 and insists that human remains found on private property be examined for anthropological potential. As of this month, a year and a half and many tons of dirt later, Ms. Baker was still trying to bury the damn skull. Goderich (pop. 8,000 on a busy day) is a small town. News travels at whirlwind speed. The OPP arrived at the Baker residence to investigate the skull at dinner time. Officers hadn’t started stringing yellow tape across the property – a sturdy Edwardian brick pile where Ms. Baker has spent her summers since first grade – when Jim Donnelly, an 88-year-old retired lawyer and judge, spotted cruiser lights in his neighbour’s driveway. “Coppers across the street,” he remembered thinking. “I’ve been interested in coppers all my life.” His son-in-law is the former Crown attorney for nearby Perth County; his daughter has the same job in Huron County, the seat of Goderich (and also Alice Munro’s territory)​. All of the officers knew the judge. By morning, the skull was news on Global. Ms. Baker had retreated to her winter house in Vero Beach, Fla., after her husband’s funeral and didn’t make it up to Goderich until April 3. By then, Mr. Donnelly had done some digging of his own. An amateur historian, he discovered that the properties on their stretch of St. George’s Crescent had originally been part of the churchyard of St. George’s Anglican Church. The church had burned to the ground in 1879 and was rebuilt closer to town. Early accounts claimed the original building had a graveyard, but there was no map of where the graves might be and no record of bodies being disinterred and moved to a new graveyard. Mr. Donnelly advised Ms. Baker to talk to the local Anglican minister, who urged her to call the head office at the Anglican archdiocese in London – maybe it had records of burials. Ms. Baker telephoned twice, but no one returned her calls. Certainly there was no mention of remains or graves in any deed of sale since the church started selling off squares of its property in the 1850s. Maybe, Mr. Donnelly suggested, there was no need for further investigation. But he urged Ms. Baker to call the Ontario government – just to be sure. That was the call that changed everything. Nancy Watkins, the provincial registrar of burial sites, war graves, abandoned cemeteries and cemetery closures in the Ministry of Government and Consumer Services – a title that not surprisingly rang the bureaucracy warning bell in Ms. Baker’s brain – insisted Ms. Baker engage a provincially licensed archeologist, who would then conduct an archeological dig on her property. 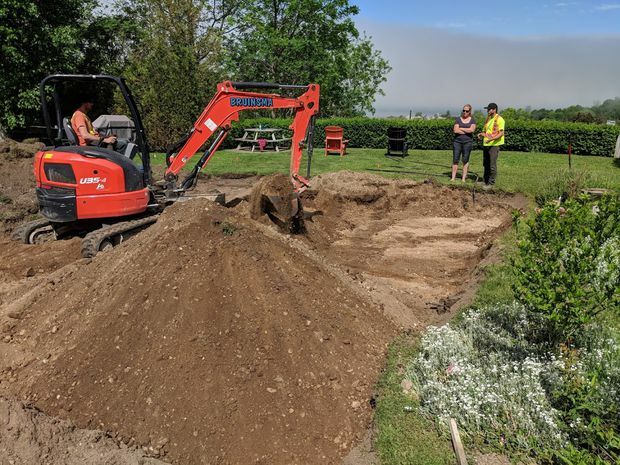 The words “archeological dig” came as a bit of a shock to Ms. Baker – “There are 400 archeologists in Ontario,” she said recently. “What do they do?” – as did the news that the dig had to be conducted at her expense. So Ms. Baker asked the registrar an obvious question: What if she simply, you know, kicked the skull back into the hole and covered it up? The registrar replied that citizens who shirk their archeological responsibilities can face a fine of $50,000 and up to two years in jail. Ms. Baker immediately sought a second opinion from an archeologist at Archaeological Services Inc. (ASI), a firm she found online. But ASI had the same advice. So she engaged its services. The exposed foundation of Ms. Baker's home. By the middle of June, with the patio renovations frozen by law until the matter was resolved, ASI had completed Stage 1 of the archeological assessment the Burial Act demands. “The property exhibits potential for the discovery of pre-contact Aboriginal and Euro-Canadian archeological resources,” the report stated. The Baker backyard also qualified automatically for a Stage 2 “aboriginal dig” because the house sits on the shore of Lake Huron, a place Indigenous tribes lived for centuries before European contact. Stage 2 was to be followed by a Stage 3 burial site investigation, to search for possible Anglican bones beneath the well-groomed grass of 128 St. George’s Crescent. The Stage 1 report was 23 single-spaced pages long and teeming with detail: the history of Goderich, the frequency of postal delivery in 1840 and the personal history of Edward Lindsay Elwood, the Anglican church’s second rector, who took the job as a preretirement posting after a busy career with his wife, an Irish girl named Ellen Yates, herself the daughter of a clergyman. A reader could be forgiven for concluding the author was being paid by the word. The second stage of the archeological dig probed through the back, front and side yards for signs of Indigenous remains. Digging two-foot-deep holes through Ms. Baker's lawn, the team didn't find anything. 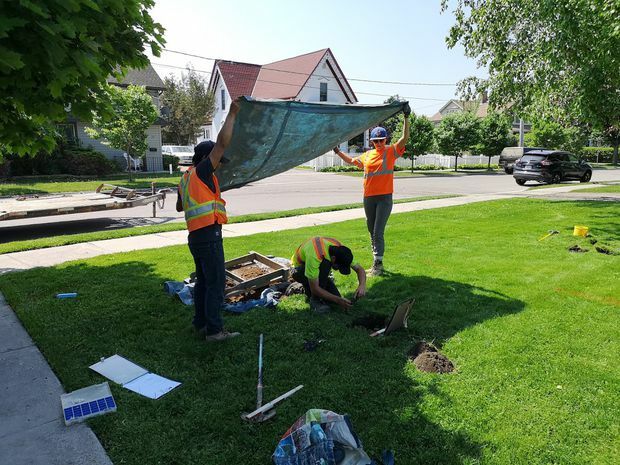 Stage 3, the hunt to discover the nature and extent of any “Euro-Canadian” remains (that is, from the Anglican churchyard), was under way by the end of May, 2018. 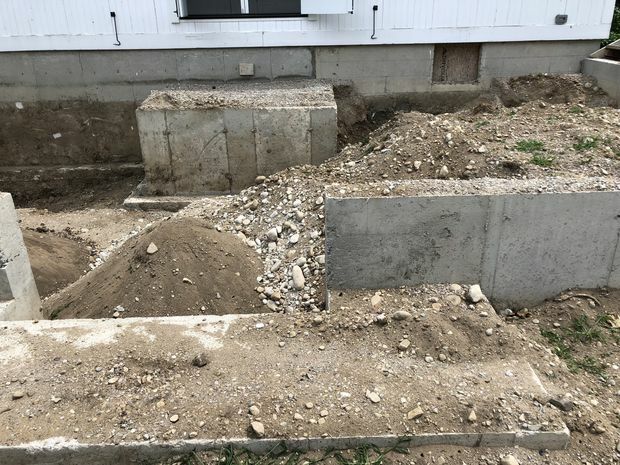 The soil on both sides of the new concrete retaining wall of the patio was fully excavated to a depth of four feet – that’s where you encounter coffin edges, if you’re going to encounter them – and screened through six-millimetre wire mesh. Then, as per the law, everything within 10 metres of the spot where the skull had been found was dug up in three phases to a depth of 30 centimetres. (Had the excavators found other remains or coffin hardware, they would have been obligated to excavate another 10 metres from those relics, too.) The yard looked as if it had been hit by a small meteor. By law, the workers were required to excavate everything within 10 metres of where the skull was discovered. Finally, on June 7, the Stage 2 resource assessment and Stage 3 assessment (burial site investigation) report reached a conclusion. “Despite careful scrutiny, no archeological resources were found.” A note of elegiac sadness was discernible in this conclusion. Which isn’t to say no one hit pay dirt. The cost to Ms. Baker of the three archeological digs – preliminary, aboriginal and Euro-Canadian – was $24,811.98, HST included. That’s just for the archeologists’ time. 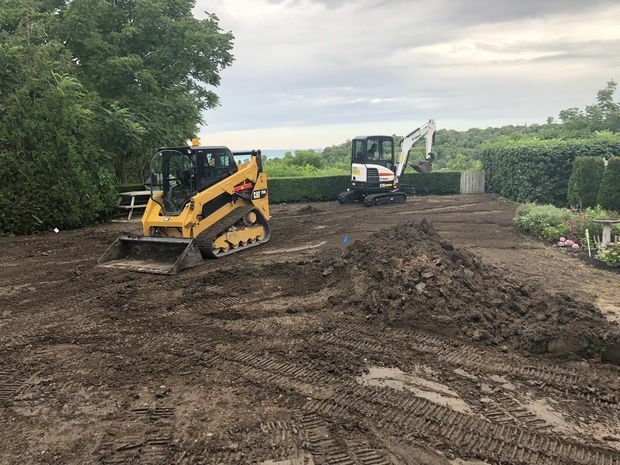 She was also obligated to cover the cost of all the machinery used during the dig (backhoes, wide-shovel archeological sifters, post-hole routers and the like) – another $24,860, which included $2,000 for a fence around the site. Resodding the lawn and replacing her watering system has soaked up another $10,000. And she expects to fork out at least $8,000 more to replace her garden. Total: almost $70,000. (Had she been forced to redig the concrete perimeter of her patio, as the ministry initially demanded, she would have been out $30,000 more.) And while she can afford it – she runs a real-estate company that sells condominiums to Canadians and overseas buyers – “it ticks you off. It does. Because it’s a waste. You could give that money to a good cause.” Of course, by stipulating that owners pay for digs out of their own pockets, the provincial government has already designated archeology as a good cause. Ontarians must pay for their history. The registrar of burials has leeway to compensate citizens who find bones on their doorsteps if an investigation will pose an “undue financial burden.” Whether a burden qualifies as undue is entirely at the registrar’s discretion. According to a spokesperson at Ontario’s Ministry of Government and Consumer Services, “the registrar may take into consideration, for example, the estimated cost of the investigation relative to the value of the landowner’s assets and liabilities, such as employment income, investments and debts.” Ms. Watkins, the current registrar, has ordered 25 burial investigations since her appointment in January, 2016; eight of them were on properties that were primary or secondary residences. No one has made a claim of undue burden in that time, and no charges have been laid for disobeying the registrar or disrespecting the bones of the dead. The project manager on the Baker dig was paid $715 a day; the project archeologist, $550 a day. “From our point of view, we have to pay our employees a living wage,” Ms. MacDonald said. “I mean, it’s a business, being a professional archeologist. If a province was worried about people like Ms. Baker potentially running into financial trouble, they should set up some kind of fund to help private citizens.” Which in fact Ontario has, arbitrary as its rules are. Eighteen months after the contractor first found the skull fragment, the entire backyard of the house had been excavated. Ms. Baker has since re-landscaped the backyard. To bury it, of course, she had to get it back. The problem was that, after 18 months of studies, no one knew where it was. “I am receiving conflicting information about the whereabouts of the remains,” the office of the registrar of burials informed Ms. Baker in an e-mail on July 11. The brainpan was AWOL. The forensic anthropologist who investigated the topper on behalf of the coroner’s office had left it on site for the attending archeologists; it was then allegedly transferred to the Centre of Forensic Sciences in Toronto, which now claimed it had never received the remains. Ms. Baker called her first archeologist, her second, her lawyer, the police: No one had the vertex. “They finally found it weeks later in the coroner’s office in Toronto.” Now it had to be shipped back to Goderich. Ignored in death, the braincase is insisting on a boisterous afterlife. Somewhat unbelievably, almost three months after the Yorick was cleared for reburial, she still didn’t have it. Her lawyer arranged for a local funeral home to “receive” the skull officially from the Toronto coroner, as per regulations. Also per regulations, Ms. Baker visited Goderich Town Hall to pay for the plot in the Maitland graveyard. The very nice ladies behind the counter, however, first needed to see the notice of declaration that freed Ms. Baker from further service to the noodle fragment. She drove home, unearthed the declaration, then drove back, whereupon the clerks told her she still needed an agreement of disposition from the registrar of burials before anyone could bury anything. Ms. Baker, ever organized, sent a request the following day. The following week, on Oct. 1, she at last received the registrar’s permission to bury the skull for good. On Friday, Oct. 12, 19 months after the skull was unearthed, it was reburied in the urn garden of the Maitland cemetery. The fragment had been packed into a decorated white container the size of a cigar box. Chris Garnier, the funeral director who had officially received the skull, was graveside, in a pink tie, as was Mr. Donnelly. He planned eventually to contribute a plaque to the grave. Pat Baker wore a smart black Armani suit and black hose and a painted black and white mandala necklace. “I felt that I should,” she said. It was a sunny afternoon in a quiet corner of the cemetery; the stillness was unexpectedly moving. “Pat, may I speak for a moment?” the judge said. It was finally over. Respect had been paid. Editor’s note: An earlier version of this article incorrectly placed the location for Alice Munro’s territory. This version has been corrected.